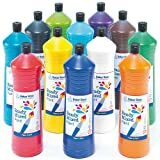 Highly pigmented and quick-drying acrylic paint. Create a shiny metallic finish. 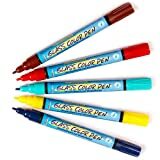 6 assorted colours: Green , Purple, Gold, Red, Blue and Silver. 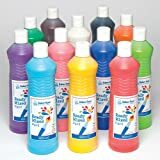 Handy, squeezy bottles each containing 600ml of ready mixed water-based liquid poster paint. 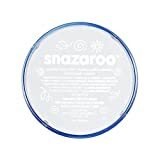 Suitable for use on card and paper. Assorted colours: Red, Royal Blue, Yellow, Mid Green, Black & White. 12 x 600ml bottles per pack. 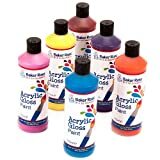 Highly versatile water-based acrylic paint for use on card, canvas, wood & more! Bright gloss finish that dries quickly and is both waterproof on most surfaces and flexible. 6 x 175ml bottles per pack. 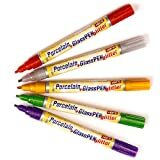 Brilliant for adding sparkling effects to porcelain & glass (Pack of 5). 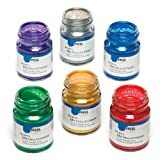 Filled with water-based acrylic paint in a choice of shining colours. Colours: Red, Orange, Violet, Silver & Green.